Click on; http://www.omot.org/roster/buses/beaver.html to learn more about the Beaver Metropolitan and the company out of Beaver Falls, Pennsylvania. Beaver was never really a hit on Broadway so to speak and little attention is given to them in literature. Shown below is fleet #126 - a Beaver operating for the New Haven Railroad affiliate Berkshire Street Railway Company of Pittsfield, Mass. 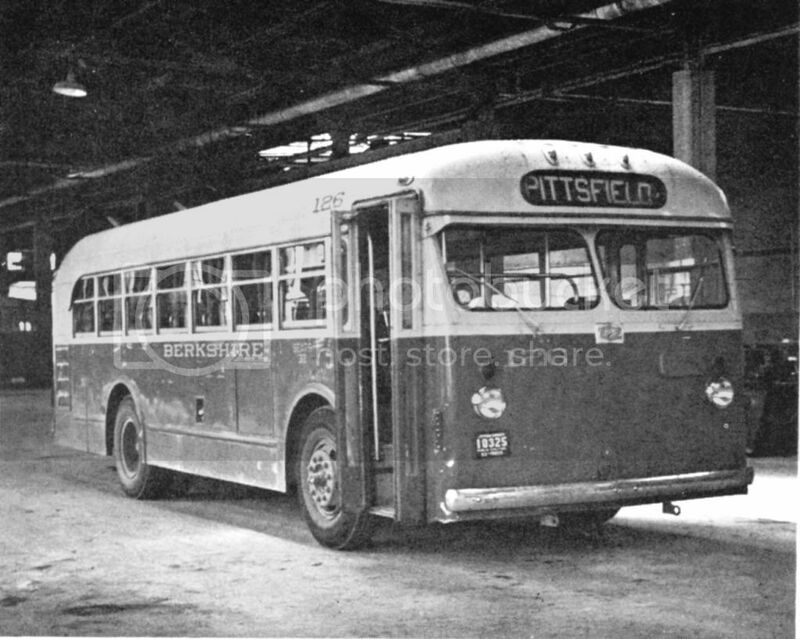 I remember these buses well on my many vacation trips to Pittsfield to visit relatives years ago. Many thanks, Mr. L, and many thanks to S-60, for the great input on the Vintage Westchester County thread and here. Comparing the Beaver owned by the Berkshire Street Rwy and the photo of a bus following Yonkers Transit 156 (posted from the gallery on May 8 ), it seems both have the same front, the same size roller sign, the same front windows. I am still searching for a Nodine Hill bus photo that clearly identifies the route, the owner, and the fleet number! So far, the photos have not been focused on the Nodine Hill bus. On the Vintage Westchester County thread, where would Nodine Hill fit, in with Club because Mid-City apparently could not sustain the route after 22 years? An article in the November 22, 1974, issue of the Herald Statesman states that the NYS DOT had found that the owner of MID-CITY COACH, Henry Malanowski, had abandoned the service. Club Transportation was asked to fill in temporarily. However, Malanowski said he had not abandoned his claim to the route, merely he could not pay the drivers! The article states that Malanowski had held the Nodine Hill franchise for 22 years, apparently about 1952-1974. Moving to the topic of Westchester Street Transportation Company. Inc., and its presence in Yonkers, I am quite certain that this firm, a subsidiary of Third Avenue Railway System, had only one line in Yonkers, namely Route H from Getty Square to White Plains. On December 10, 1936, the Yonkers Herald Statesman ran an article, "Court Permits Bus Company to Form [insurance] Fund." The article goes on to say that Westchester Street Transportation Company, Inc., operates 49 buses. The above list showed up earlier, in the July 20, 1933, edition of the Daily Argus of Mt. Vernon, as found on fultonhistory.com. The article explains the operations of each of the firms. Of interest to me is the reference to North Street Transportation Corp. "between the Cities of Yonkers and White Plains" and the Hastings Railway Co. between Yonkers and Hastings. I now recall that the #1 streetcar would terminate on Warburton Avenue at the Yonkers-Hastings border and would be met by a bus in Westchester Street Rwy colors, red and cream. Before my time, the full streetcar trip into Hastings had been discontinued. In 1942, the Nodine Hill service was run by Club Transportation. Apparently, Mid-City took it over about 1952. The name Bernacchia Brothers Bus shows up in early descriptions of bus service in Yonkers. The January 22, 1963, obituary of Joseph Bernacchia, age 64, explains that he ran jitney service in Bridgeport, Connecticut, and moved to Yonkers in 1925. "In 1934, after serving Yonkers travelers, Mr. Bernacchia and his brother, George, introduced a new "super-safe" transit type bus, with four-wheel air brakes, all-steel body, and easily disconnected motor. This bus was the first of its kind in Westchester County." In newspapers of the 1930's, Bernacchia Brothers Bus offered summer hourly service from Getty Square to Playland, Rye. The firm regularly served North Yonkers, on a zig-zag route east of the #2 carline. A story in the March 12, 1938, Herald Statesman, describes Yonkers Board of Estimate approval of Bernacchia's request to extend service to Hastings..
At some point, they began to serve Hastings, but it took a while for them to win a North Broadway route from Getty Square to Roberts Avenue. That is, it seems that Hastings was reached by North Yonkers buses using North Broadway only above the Roberts Avenue terminus of the #2 carline. TARS objected to competition on North Broadway where it was close and convenient to the #1 car. In the 1942 compilation mentioned in my preceding post, Bernacchia Brothers Bus left Main Street, Hastings, on a 20-minute headway. The trip to Getty Square cost ten cents and took 25 minutes. Ten minutes later, it left Bellevue and Roberts Avenues, and the fare was five cents. In 1942, it seems that all local bus companies used Hudson Street and South Broadway as their starting point. I wonder if I'll ever come across a photo of the line-up there. In 1947, the Bernacchia brothers posed in front of four new Macks their firm had just purchased. In 2014, Bee-Line route 6 provides direct North Broadway service to Hastings and beyond, with about 44 trips on weekdays. Bee-Line route 9 North Yonkers somewhat replicates the zig-zag northwards travel of Bernachia Brothers' North Yonkers route, but it now is a clockwise loop, returning directly south in the Nepperhan Valley. The schedule displays only 9 trips Monday-Friday, none on weekends. Bee-Line route 2 gives frequent service to the populated ridge of Park and Palisades Aves. The 1932 ad extols the use of SOCONY lubricants by Yonkers Bus Inc on its hilly routes, particularly between Getty Square and Bryn Mawr station. In 1956, when Club Transportation purchased Yonkers Bus Inc from Robert Tostanoski, the Herald Statesman article stated that he "has been a bus operator in Yonkers since 1926." The Yonkers Bus Inc buses apparently did not carry route numbers, but in 1957 the new owner, Peter Gallagher of Club, added the route number 30 that it carries in 2014 as a Bee-Line route. On a 1942 Herald Statesman page of how to reach Getty Square, Yonkers Bus Inc seems to present two or three routes. One is the above-mentioned predecessor of Route 30, operating from Getty Square, north on Saw Mill River Road, uphill east on Lockwood Avenue (needing dependable gear-box lubricants as in the SOCONY 1932 ad), past Bryn Mawr Station, into Bronxville, and then southeast to New Rochelle. In 2014, this trip is scheduled for 65 minutes. The information collected by the Yonkers Chamber of Commerce in 1942 gives an unbelievable running time of 25 minutes, perhaps confusing the route segments east and west of Bronxville. Yonkers Bus Inc also operated a bus within Bronxville. I wonder if that is the reason for the Bronxville Bus photos seen on Bustalk. The other route was a feeder to the #6 trolley at Nepperhan Station. It appears that, until the trolley was abandoned, Yonkers Bus Inc was denied stops along the trolley route, as TARS had a valid franchise. I'm not certain, but it seems that the #6 trolley east of Nepperhan Station (Putnam Division at Tuckahoe Road) was abandoned about 1927, which is also the time when the Bronx River Parkway and River construction was undertaken and also the time when Mr. Tostanowski got into the bus business. By 1942, this feeder began by meeting the streetcar at Nepperhan Station and continued east on Tuckahoe Road 7 minutes to Central Avenue, 8 minutes to Colonial Heights (Mohawk Road), left the City of Yonkers (by crossing the Bronx River), entered the Village of Tuckahoe, in 10 minutes (cumulative time) reached Main Street, Tuckahoe, crossed the Harlem Division of the NY Central RR. Then 15 minutes to Crestwood on the east side of the tracks, then 25 minutes to Interlaken Gardens at California Road. The minutes in the previious sentence are travel time from Nepperhan Station. Much of this route seems to follow streets that once had TARS streetcars, possibily abandoned by 1927 or so. The route via Bryn Mawr continues to this day as Bee-Line route 30. I have not learned what happened to the feeder route when the #6 streetcar quit in 1962, but present Bee-Line route 8 provides about 45 trips a day from Mt. St. Vincent to Getty Square, Nepperhan Station, and Tuckahoe. No service from Yonkers reaches further east on what was the Yonkers Bus Inc feeder route. I suspect that low patronage there hurt the streetcars in the 1920's and the substitute buses. The purchase of new Mack buses is the subject of a Herald Statesman article dated Sepember 24, 1927. The buyer needed the buses to qualify as an operator of a new franchise. The article states that the buyer Merchants Community Bus Transit Inc. also asked to change its name to Terrace City Lines, Inc. The article includes a description of the buses and proposed routes, so I urge readers to check the link two sentences back! Regarding the Suburban Bus Company a Herald Statesman article dated June 23, 1932, states that the Suburban Bus Company picked up two franchises of Merchants Community Bus Transit Inc. in 1928, namely the Central Avenue and Midland Avenue franchises. I suspect that some of the other Merchants routes were non-productive. One such, the Ridge and Morsemere Avenues route, seems too close to the Bernacchia Brothers North Yonkers route that did succeed. Zipping ahead in time, Club Transportation purchased Suburban. A major hassle existed in the 1930's and 1940's. The Central Avenue bus route could not extend south of McLean Avenue to the Jerome Avenue IRT subway. Passengers either transferred to the #4 trolley, which had the franchise, or rode far east on McLean Avenue to the White Plains Road IRT. Regarding the Suburban Bus Company in 1942, the routes were lettered A, B, C, D, and F. I base this on the full-page set of directions for reaching the stores of Getty Square published in the Herald Statesman of September 29, 1942, and linked HERE. Unfortunately, the Chamber of Commerce ad contradicts itself with regard to whether Bus A reaches Getty Square. I deduce that A is Bee-Line route 20 with an important twist. It began at the White Plains Bus Terminal, traveled down Central Avenue to a transfer point with other Suburban Bus Company routes at Midland Avenue, continued down Central (Park) Avenue to McLean Avenue. It then turned east to the edge of Yonkers at Bronx River Road and the Nereid Avenue Bridge. Central Park Avenue south of McLean was off-limits because TARS held the franchise. This issue would be resolved only after Club purchased Suburban in the late 1940's. So, Route A mostly equals Route 20. B, C, and D were variations on Kimball Avenue and Midland Avenue, presumably reaching Getty Square from the intersection of Midland and Yonkers Ave (according to the 1942 ad) and possibly using Ashburton. There may have been boarding restrictions so as not to compete with the trolleys that had exclusive franchises. I judge that B, C, and D evolved into the present Bee-Line route 25, a healthy east-west route with 44 trips daily. Midland Avenue, Yonkers, is a zig-zag north-south avenue, shaped a bit like a staircase. The east-west section, the step of the staircase, is what Bus 25 uses. Suburban Bus Company route F still exists as Bee-Line 26, with only ten trips daily. Passengers along Bronx River Road need timetables and accurate watches for the 75-minute headway. A photo of new GMC TDH 4512 buses (numbered 45-49) with air-suspension is featured in a April 19, 1954, article in the Yonkers Herald Statesman. The link is HERE. Club Transportation purchased these buses for the route from White Plains south on Central Park Avenue to Bedford Park Blvd Independent Subway station. Note that the roller signs show this as route 8. Because the 8 designation was also used by Yonkers Railroad buses on Riverdale Avenue, this Central Avenue line later became route 20. In a very obvious place I came across 24 photos of Westchester County buses, some photos of more interest than others. Unfortunately, the page does not allow a link to the individual photo, so I must place the link below and ask you to look through the 24 photos by yourself. I number the 24 photos across the page. 1) A New Look marked 601 Charter. 2) BERNACCHIA BROS INC 50, a postwar Mack, destination HASTINGS. Photo taken near Yonkers train station. 3) Chappaqua Transportation, Inc. 1776 in red,white, and blue. 4) Club Transportation 762 at East 238St. starting point. Is it a White? 5) Consolidated Bus Lines, 64, a GM. 6) County Transportation Co. 139, a 1946 GM TDH4610. 7) Bee-Line 1989 Flxible MetroB, fleet number 847. 8) Honeymooners ad on bus on Warburton Avenue near Hastings City Line, with Armstrong FM Tower seen at Alpine NJ across the Hudson. 9) Liberty Coaches 200, marked Hastings-Yonkers, a postwar GM. I presume this photo was taken after the name Bernacchia Brothers was removed from this route. That is, Bernacchia became Liberty. 10) Liberty Lines MCI 2821. 11) Three buses displayed in front of the Kensico Dam, a Bee-Line RTS, a Liberty Lines Scenicruiser, a Liberty Lines MCI. 12) Bee-Line 1986 MCI coach PA924. 14) Bee-Line 601, marked for route 7 westbound. 15) Pelham Parkway Express 1964 Flxible 508? , parked at the comfort station on Pelham Parkway at White Plains Road. 16) Port Chester and White Plains Bus Line 21, a postwar GM. 17) Riverdale Transit New Look 385 parked along the Hudson. 20) ASTOUNDING Suburban Bus Corp, marked Tibbetts Brook. Radiator front center. A 1930's Mack or what? 21) Surface Transportation System 3008. Twin? 22) Bee-Line 3330 and 142. 23) PUZZLING Victoria Bus Co.
24) Yonkers Railroad Co. 1958 C49DT New Look Mack 165 at a train station I cannot identify. I suspect Mount Vernon, but I don't see catenary. Soon thereafter, Yonkers Transit bought Yonkers RR. Corrections, comments are welcome! BusTalk allows editing, so I have begun to expand the descriptions. Thanks to S-60 for his helpful rosters in another thread. I just came across a 1945 newspaper article declaring that two 30-passenger Reos had just been delivered to Yonkers Bus Inc. and that four more were on a delivery schedule. Robert Tostanoski seems to have kept his Yonkers Bus Inc. going for about 30 years, approximately 1927-1958. What happened to the Reo name? I just came across a 1945 newspaper articles declaring that two 30-passenger Reos had just been delivered to Yonkers Bus Inc. and that four more were on a delivery schedule. I believe, and someone can correct me if I'm wrong, that Reo merged with another company at some point. 1945 must have been a 'banner year' for REO because they sold two 31 passenger model 96-HDT's to North Shore as well. Without going to the trouble of reading the history of REO, I can tell you off the top of my head that the name stood for Ransom E. Oldsmobile (one of the very first American car makers) and at some point very early on GM bought the Oldsmobile car division from REO leaving them to continue making only truck and bus chassis. Many thanks to S-60, Hart Bus, and Mr. Linsky for helping with this news item about a REO purchase!